Mt. Shigi is said to be the first place in Japan where Bishamonten appeared. Legend has it that when Prince Shotoku Taishi prayed for victory over Mononobe no Moriya, – an opponent of the Buddhism that the prince was promoting – Bishamonten appeared on Mt. Shigi at the hour of the tiger, on the day of the tiger, in the year of the tiger, and led the prince to victory. To express his deep gratitude, the prince built a temple dedicated to Bishamonten in 594 and named the temple Shigi-san which can be translated as “the mountain to be trusted and respected”. This anecdote is believed to be a reason why paper-tigers are placed around the temple. Affectionately known as “Shigi no Bishamon-san”, the temple is especially crowded with visitors during their first visit of the year (New Year’s Day). 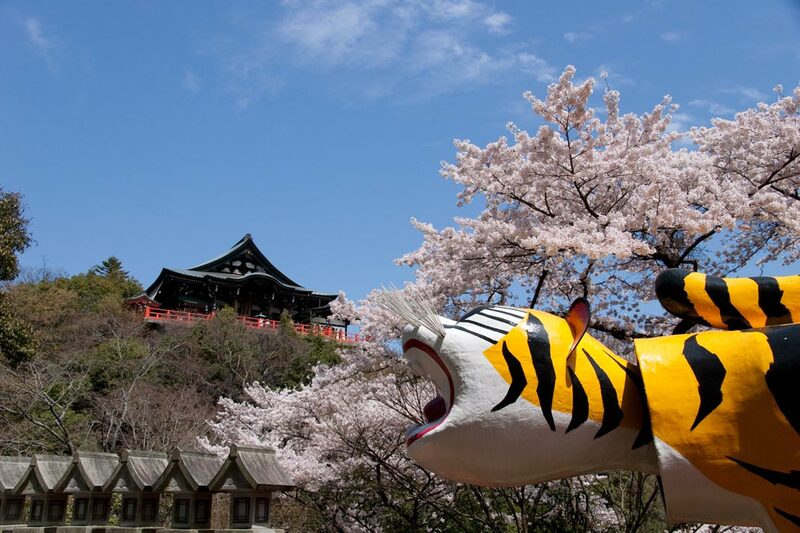 As the temple enshrines Bishamonten, the original god of war and warriors, and also has a tiger as a guardian god, Chougosonshi-ji Temple is also famous for attracting professional baseball players from the Hanshin Tigers who go there to pray for victory. Shigi-san Chougosonshi-ji Temple is the head temple of the Shigi-san faction of Shingon Buddhism and is located in Mt. Shigi in Heguri Town, Ikoma, Nara Prefecture. It is also the head temple of Bishamonten, one of the Seven Deities of Good Fortune. The “Bishamonten” are dedicated to the God of war. There are three famous Bishamonten in Japan. Saishouji Temple, in Oiwa, holds one of them, the Oiwa Bishamonten. The other two are located on Kurama mountain in Kyoto Prefecture as well as the abovementioned Shigi Mountain in Nara Prefecture. The main hall was rebuilt in 1762(Houreki 12nen) and in 1993 it was widely repaired. The principal image is 1.8inches tall and is made of pure gold. It is said to have been made by Shotoku Taishi(the regent of Emperor Suiko in the Nara period). Here many votive pictures of horses are dedicated. Henri Joly, who didn’t always get things exactly right, cited Ernest Eitel about Bishamon in saying that “…he was canonized as God of Riches by Hiuen Tsung in 753, and plays an important part in exorcism…. Getty notes that “In Japan [Vaiśravaṇa] is worshipped under the name Bishamon, and is represented in armour ornamented with the seven precious jewels, and is generally standing on one or two demons. In his left hand he holds either a small shrine or the flaming pearl, while in his right is a jewelled lance.” The shrine is said to represent the Iron Tower in India where the Buddhist scriptures were found. 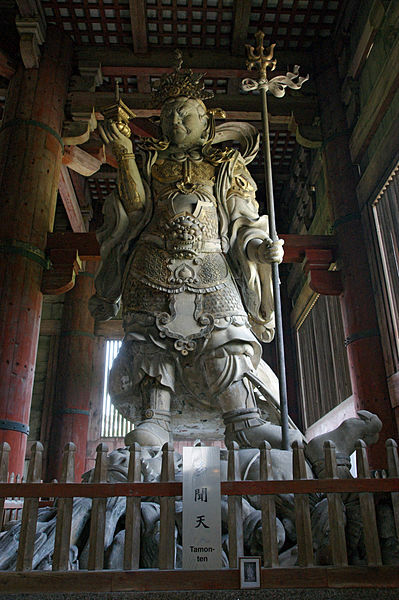 Bishamon is often shown looking at the shrine as a symbol of him overseeing the treasures of that religion. In a 1906 volume of Kokka there is a one page entry entitled “Portrait of Bishamon-ten (The Indian Mars)”. Joly in 1906 identified Bishamon as one of thesan-sen-jin (三戦神) or war gods. This figure he says is represented by a head with three faces riding on a boar. August Karl Reischauer, Edwin O’s father, said he is in his Studies in Japanese Buddhism originally published in 1917. That same year Basil Stewart concurred, but added that Bishamon was also the god of glory. Bishamon as the god of wealth – A number of ancient Japanese texts say that Vaiśravaṇa is the same as Kuvera (sometimes Kubera) the ancient Hindu guardian of wealth. According to Chaudhuri “These writings projected the image of Vaiśravaṇa as a god of wealth to the common Japanese, in addition to that of a protector of the country. Thus he became a god of fortune. The Indian equivalent of Bishamonten or Tamonten is Vaiśravaṇa – the Indian guardian of the northern direction, and his home is in the northern quadrant of the topmost tier of the lower half of Mount Sumeru. He is the leader of all the yakṣas who dwell on the Sumeru’s slopes. In the Pāli scriptures of the Theravāda Buddhist tradition, Vaiśravaṇa is called Vessavaṇa. Vessavaṇa is one of the four Great Kings, each of whom rules over a specific direction. Vessavaṇa‘s realm is the northern quadrant of the world, including the land of Uttarakuru. According to some suttas, he takes his name from a region there called Visāṇa; Vessavaṇa has the authority to grant the yakkhas particular areas (e.g., a lake) to protect, and these are usually assigned at the beginning of aVessavaṇa‘s reign. When the Buddha was born, Vessavaṇa became his follower, and often brought the Buddha and his followers messages from the gods and other humans, and protected them (Source: Wikipedia entry on Vaisravana. ) It maybe a somewhat futile or frustrating task to sort out whether the origins of Bishamon are Chinese or Indian as Buddhism originated in India and Buddhist figures and concepts filtered to Japan, not only via China (after having evolved or having been transformed there) but also directly by Indian monks to Japan or interacting with Japanese monks. 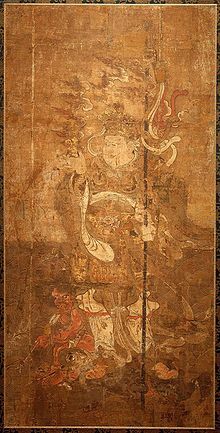 In Japanese iconography, Bishamon is portrayed holding a spear in one hand and a small pagoda in the other hand, the latter symbolizing the divine treasure house, whose contents he both guards and gives away. For images of Bishamonten in Japan, see the BISHAMON, BISHAMONTEN article.